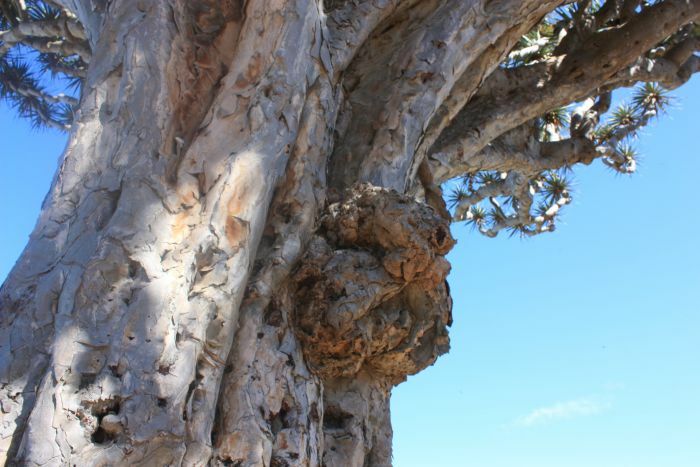 Facts and fiction of the famous dragon tree. 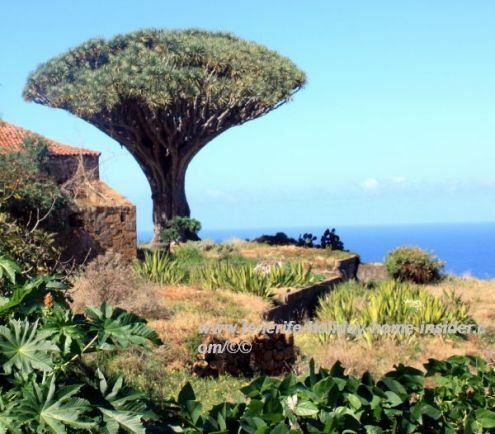 Indeed, the dragon tree is famous all over the world. It's not only part of Greek mythology. It's an almost 20 million year old remnant of the Miocene period. The one of Tenerife is unique for Macaronesia. 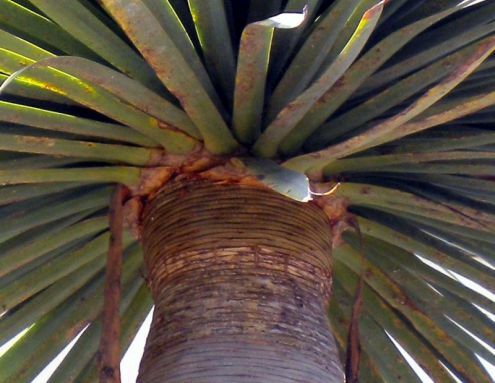 It's a Dracaena Draco a national monument since 1917. That was more than 218 years after Alexander von Humboldt made a drawing of the Draco of Orotava which was even bigger and older. They regard growing facts i.e. the calculating of the age of this plant. 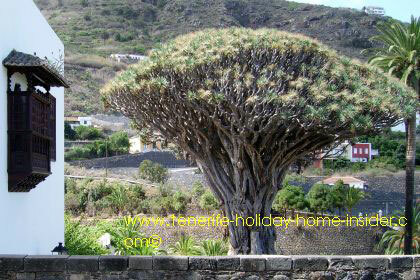 Kindly compare the following photos of one and the same Tenerife Drago tree. Orotava Drago of June 2014. 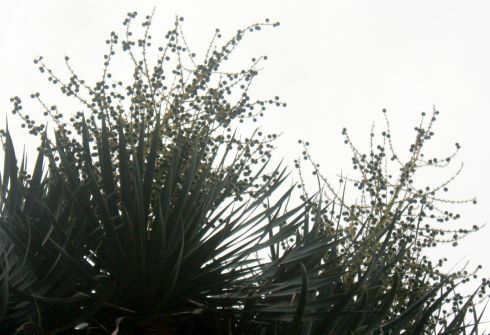 Botany news of repeated flowering of Tenerife Drago. Dragon tree Orotava with unique trunk and roots. Orotava Drago in bloom 2 years later again. The same tree flowers again in June 2017, only one year later. Flowering and one bunch of red berries on South side in June 2017 at la Hijuela. 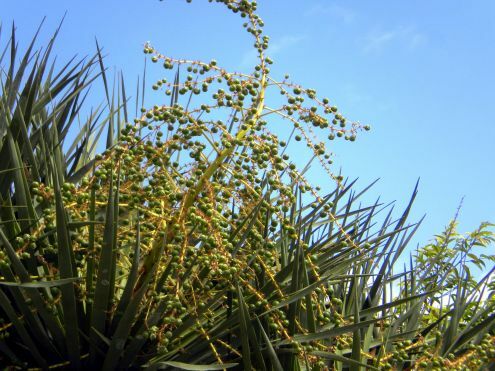 It grows in the very protected Hijuela park the daughter of the Botanical gardens of Puerto de la Cruz. The several year flowering cycles depicted by one and the same tree above is sensational. It's also contrary to facts given in Wikipedia and by other prominent websites. A cold winter can't be the reason, as the last of 2016/2017 was rather mild. 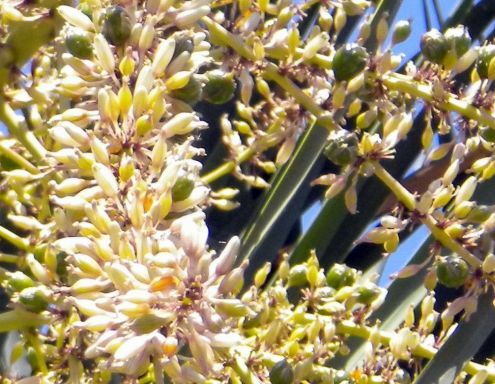 In fact, therefore, most Dracos of Macaronesia may be much younger. Why? It's said that the age depends on how often a tree flowers and branches out. Also, it's extremely unlikely that the healthy Hijuela Draco with its most gigantic trunk without air roots has ever been trimmed i.e.manipulated by human hands. Interested scientists are welcome to get in touch with the JAO or the government ICIA of Puerto de la Cruz. Find the address here of the ICIA the government scientific department which handles El Jardin de Aclimatación de la Orotava and please, have it verified. 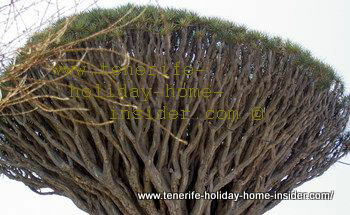 The Tenerife Holiday home insider doesn't have any reason to make up false facts. However, she could not say how often related species flower in other countries or on other Canary Islands. 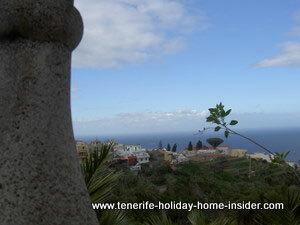 This so called 1000 year old icon of Tenerife may not have been around for more than about 350 years in 1997. Then, it had a height of 18m and about a crown circumference of 19m by 2014. Its trunk wasn't weathered. However, it was scarred by broken off branches. Air roots grew over it from the top down. They may have covered year rings, if there were any before. Note the interesting trunk of a recently matured Draco below. 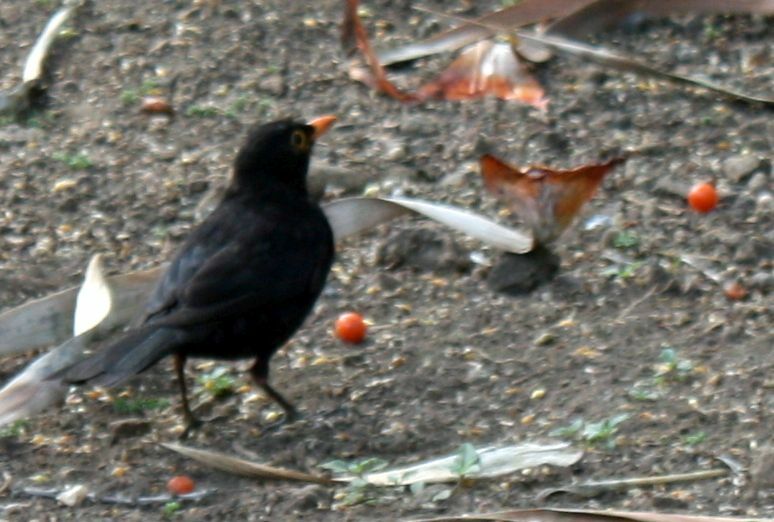 A slightly older one also gives food for thought. Its amazing texture was revealed by an accident of photography. First time flowering Draco tree. Normally, the tree starts to branch out naturally in symmetrical fashion after its first time flowering. This may happen when it's is about 11 years old when the fruit spikes have fallen off. Some of the wounds trigger new shoots from within the trunk. 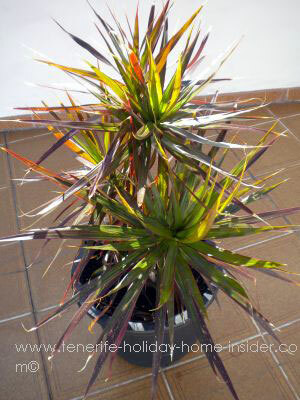 However, by experience with Dracaenas, the Tenerife holiday home insider doubts very, very much that dragon blood drips from broken off leaves. This must be one more of those false Internet Website myths. El Drago of Tenerife in flower and with berries. Puerto Cruz Drago Draco in flower. 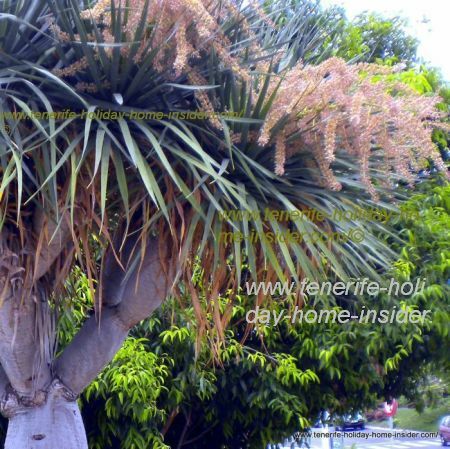 The color of the dragon tree flowers and berries depend on different stages. Flower colors go from whitish to pink and then to almost orange. Berries start off green and turn eventually to a rusty red. Then, they become edible. They are also used for varied other purpose, as was custom with the trunk zap the blood of the Drago, as well. 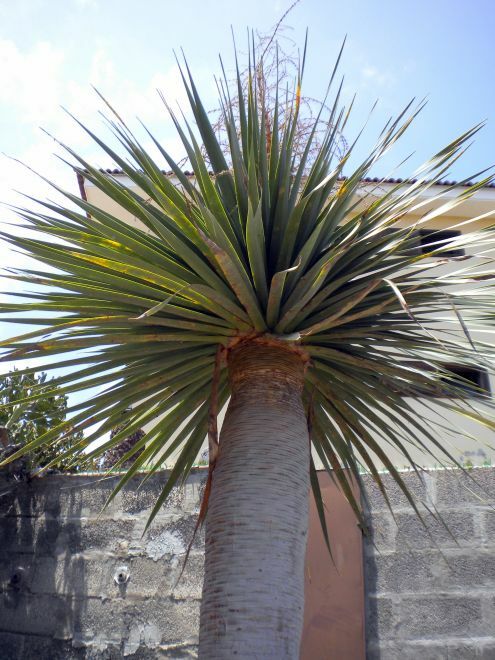 A lesser known Draco Dracaena tree of Realejos. 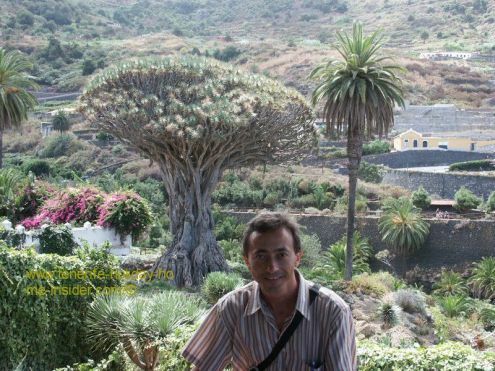 The Siete Fuentes of San Agustin which is said to date back several hundreds of years may be the oldest of all Dragon trees of Los Realejos. It's named after the Count by that name and the partly abandoned Hacienda from XVII where it still grows. Below admire the same Drago from different angles. Siete Fuentes Centenario ocean views. A Drago or Draco by the ashes of a perished convent. The depicted botanical wonder of the legendary tree of Realejo Bajo San Francisco is as much celebrated as the one of Icod. It is a living monument in its own right. 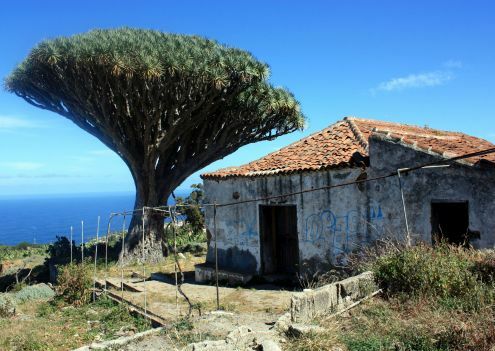 Not even a devastating fire which destroyed the Franciscan Monastery next to it in 1952 could harm this ancient plant trophy of the many natural Tenerife wonders. 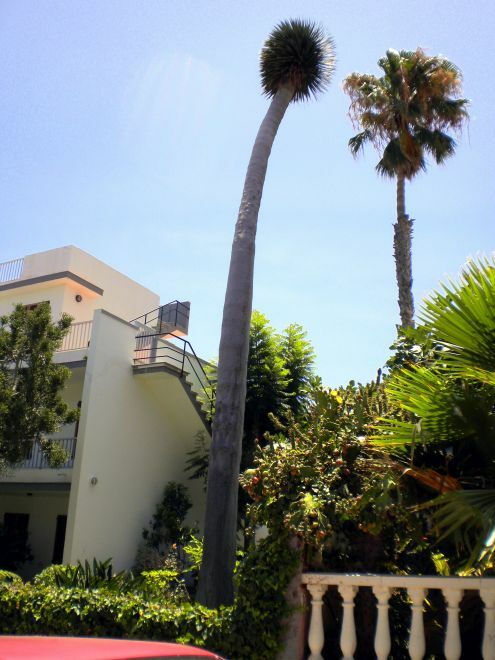 No ticket required to get to the Realejos Dracaena. The Realejo Bajo main Drago tree stands on elevated ground and has a low fence. No entrance ticket required, contrary to the Icod Milenario version. In fact, the island trophy Draco of Icod de los Vinos has an electric fan in its partly hollow trunk. It keeps fungi at bay, while regular, phytopathological tests are important to check the entire plant's vitality. 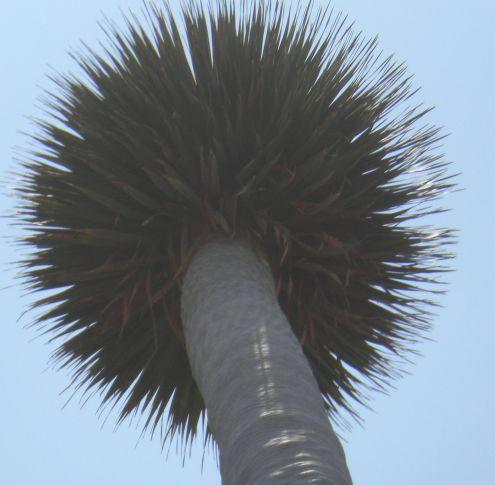 Find the Realejos Dragon tree at the intersection of the streets C/ El Medio and C/ la Luz. It sits on an elevation by the pretty and interesting cemetery of Realejos Bajo. The standard street lamp next to it lets you guess the Draconian tree's height. Then there are the stunning twin dragon trees by the main church of Realejo Bajo. Never prune a Drago or Draco Dracaena's top, unless you want to take a chance to change its appearance. Of course, this defeats the general rule of giving more air to tree branches. Drago of La Matanza a trimmed Draco. The Draco of la Matanza has most probably been altered by humans. It looks like its head with huge crown was cut off. Left was a short, fat stem, bare on top. The end of a dry period is the best time to do so. Professionally done, the wound must bleed, be treated with plant fungicide and and sealed with botanical varnish. However sometimes, a shallow container is placed on the decapitated tree. This may still cause tree rot, though. Extremely tall Tenerife Draco never cut. Giant single stem Draco Puerto Cruz. The extraordinary, giant Draco is somehow protected by double story buildings around it. Obviously, it never flowered and was never cut. Contrary to it are the Dracos of Hotel Maritim. 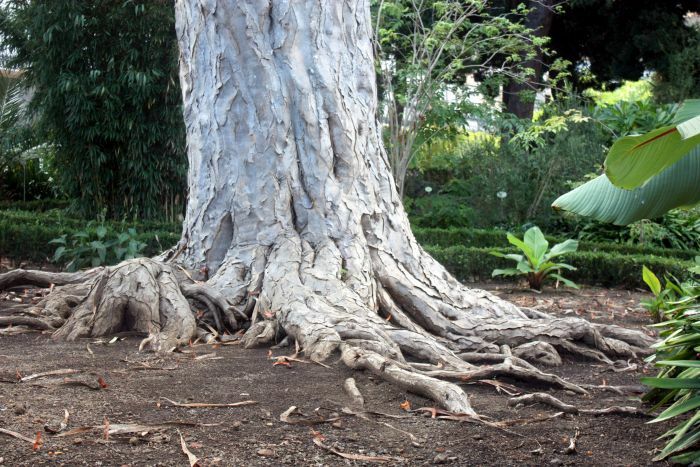 Their roots have less space, as several trees were planted close together. They flowered, but branches have little chance to spread. 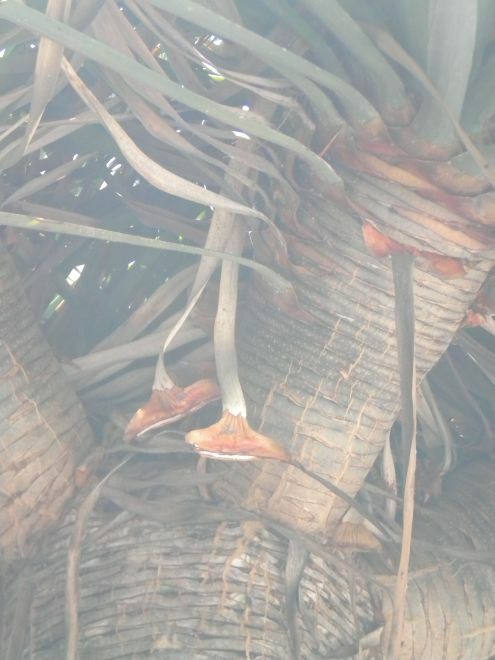 Dracaena Draco survival gear and natural defense mechanism. The Draco's intertwined growth of branches within its dense top plays a big role. It acts like a phalanx. It contributes to the tree's static balance together with its sturdy trunk. Its widely spreading underground roots help as well as its reinforcing air roots. This natural survival gear withstood a storm of partially 170km/hour in Jan/Feb of 1996. 79 tons of weight of the crown of the 'Milenario' with their water storing branches were no objection. Source of information of the last paragraph. 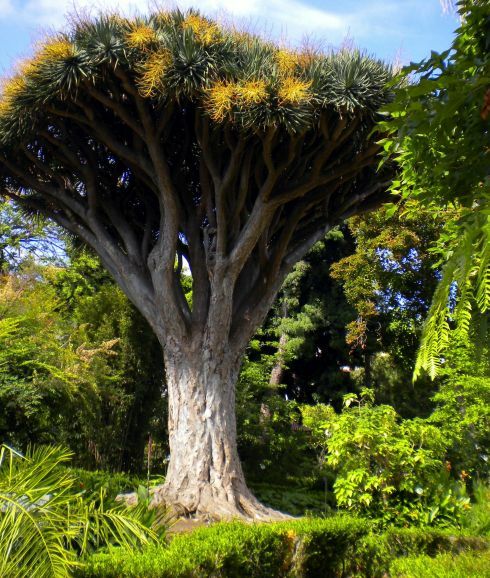 The Tenerife holiday home insider's theory regarding the dragon tree's amazing qualities is based on long time observations and experiences with botany. It has been confirmed by scientific, university research here. 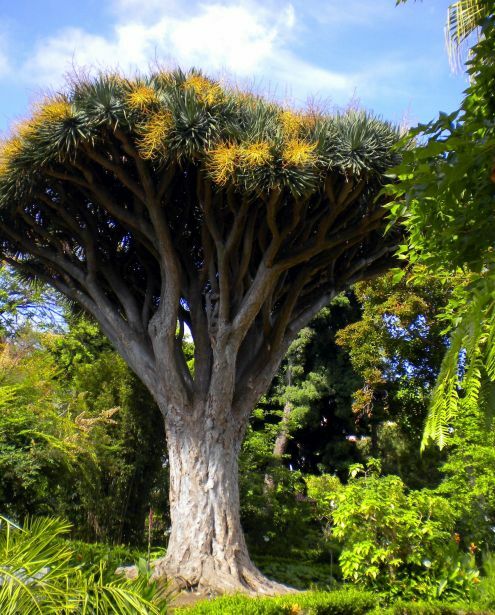 Will storms or pollution harm dragon trees more? 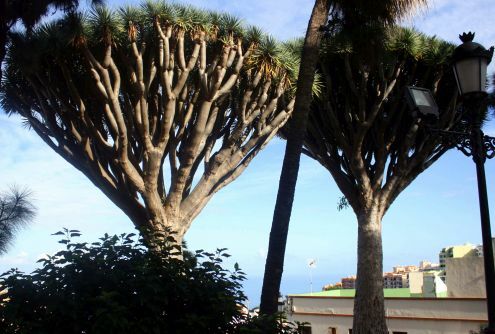 3 Dragon trees at La Orotava bridge. 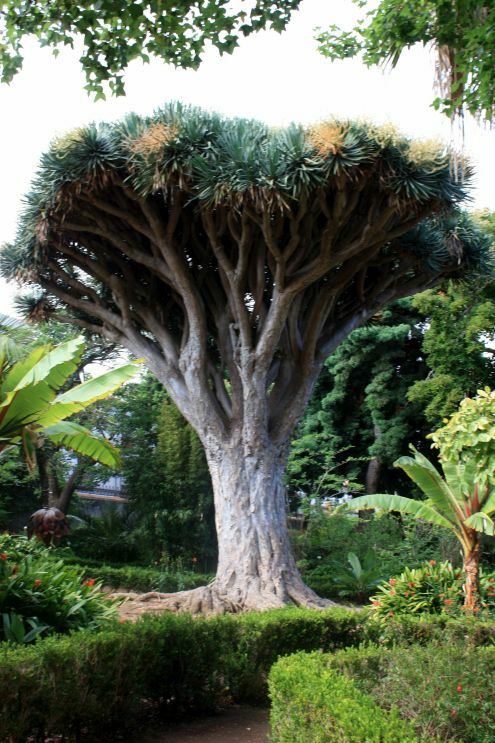 Gales, Tornadoes and Hurricanes don't usually kill dragon trees, such as the ones of La Orotava by its bridge. The biological clock of the plant has usually more of a say. Not even its amazing immunity can save it any longer when its time is up. This happened to Humboldt's Draco, 68 years after he had admired it. 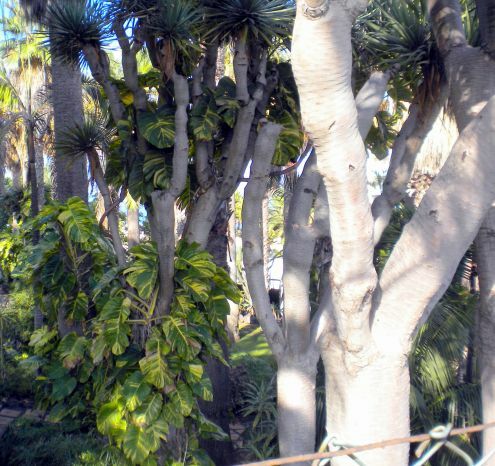 The trunk of this legendary tree of the Garden of the Franchy family of Orotava had become too hollow. It suffered in a storm in 1819 and broke into peaces after a hurricane in 1868. Proof of the Tenerife Draco's toughness are its numbers. However, most are endangered by pollution and chemicals, nowadays. By the way, chlorinated tab water as well as an insect similar to Whitefly seems to harm some Draco trees, off lately. Since the dawn of time of Dinosaurs. 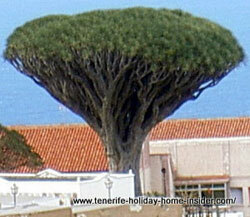 The Tenerife Drago specimen of the Asparagus family have survived since the Tertiary Period. The same can be said of those of the Atlas mountains and of storm prone Madagascar. The most alien looking ones remain on Socotra an Indian Ocean island South of Aden. License needed to remove dragon trees? You can't just discard your own. You need permission from the Town hall people. Eventually, they will use them somewhere else. What helped the Draco in Macaronesia? A mild climate influenced by both the Golf stream and the warm African continent nearby. Any truth to the following legend? 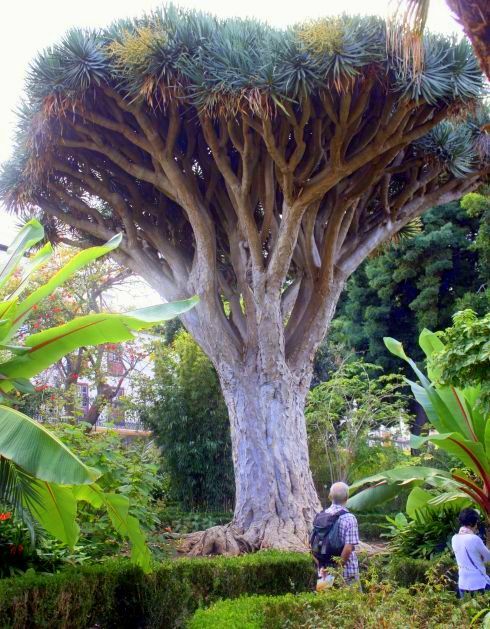 It's said that dragon trees were growing from the blood of the dragon of 100 heads that was killed by Heracles the Greek hero. Mind that Schliemann turned the assumed fiction of the Troyan horse into reality. Other legends also worked out to be true against all odds. So, the reader may decide. More in Spanish about the fabled tree of Greek Mythology. Unfortunately, none of related webs in English that we've found are Chrome proof i.e. not safe to recommend to you. Landmark, Tagoror and gift of God. The Realejos Bajo Draco is very exposed on top of the ridge above the gorge Barranco Godinez. To be visible helped always. Why? The Draco had supernatural qualities for the Guanche. They also used it for important Tagoror assemblies. Gorge with Draco an ancient landmark. Santa Cruz downtown ancient Draco. The blessed tree of Guanche medicine. 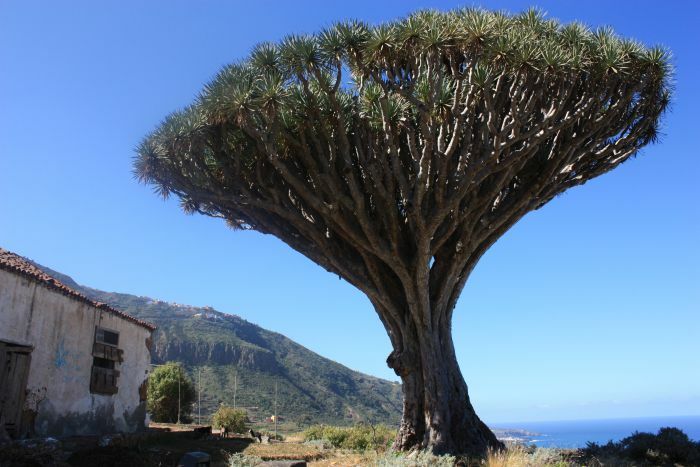 Almost all Draconian trees of the Dracaena family seem to be gifts of the gods. Their raw materials are good for craft works. Sap, fruit and leaves have homeopathic healing power for wounds, ulcers, burns and even for gum infections. 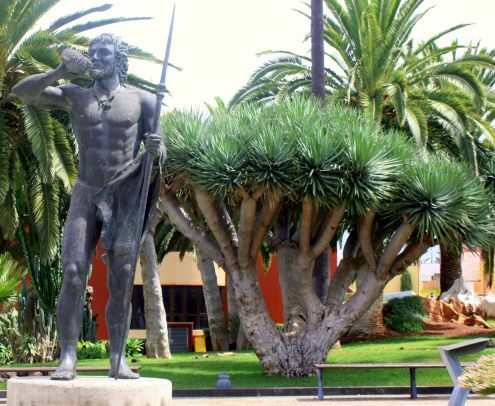 Visit one of Santa Cruz museums of Tenerife when you are in the capital. Go to the 'Museo del hombre y de la Naturaleza' museum of nature and man. 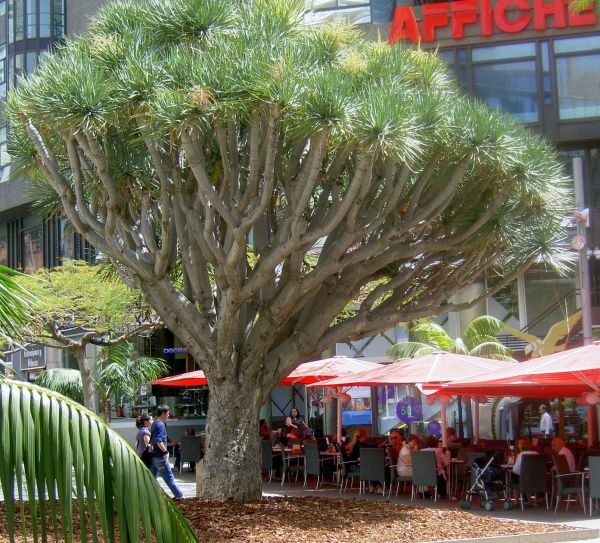 There, much is taught about those mythical Tenerife trees which passed the test of time even regarding Guanche afterlife treatments. The ecological dye of the dragon tree is said to have been used for this most famous violin from the town Cremona. True or not? Pot Ash has the same affect on timber but, may not be suited as varnish, contrary to dragon blood. Want a famous Draco of Tenerife? 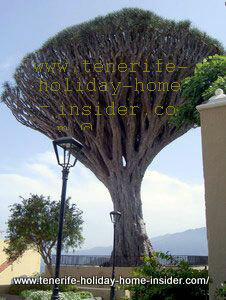 Don't be seduced by the many offers of mini dragon trees on Tenerife markets. Their root system is not ideal in a confined space, in case you have decided to buy one for your holiday home in Tenerife. 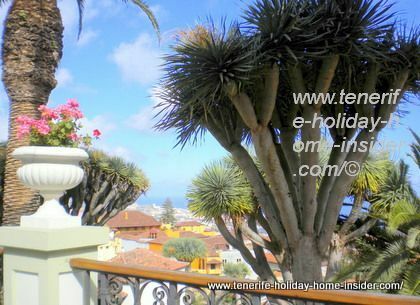 The Tenerife holiday home insider has a cousin of it on her terrace. She grew this Dracaena marginata from a cutting. 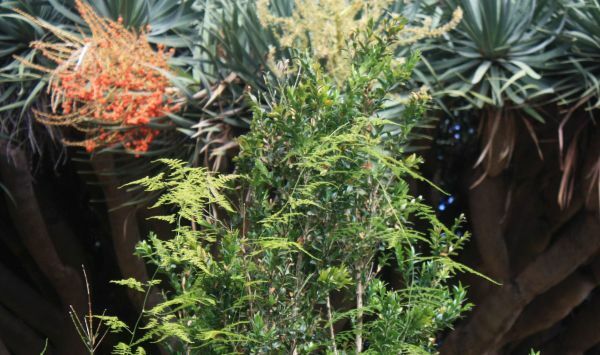 She had many similar Dracaenas and related tall Cordelines in her South African Durban garden at 17, Alexander Drive of Gillits in Natal. Once, she was given a Tenerife Draco. She passed it on to a friend who has left. This Draco may have grown big and tall by now at the end of Jan Smuts Avenue on the Winston Park ridge, if not killed by bush fires. Return from dragon tree to Los Realejos where Tenerife endemic plants abound on green roof tops, too.